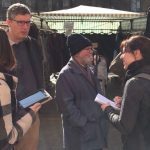 In 2018, Tower Hamlets Council commissioned a C3-led community investigation using C3’s CHESS™ tool as part of its flagship Communities Driving Change programme. The programme puts local residents in the driving seat by asking them what the response to their health and wellbeing needs to look like. The approach brings together people from neighbourhoods to see what is working well and what is important, and to develop a plan that everybody – including services – can support to make a difference to people’s lives. Four organisations – Bromley-by-Bow Centre, Poplar and Limehouse Health and Wellbeing Network, MyTime Active and The Young Foundation – and their partners are leading this approach across the borough. C3 is working in lot four, in the north-west of Tower Hamlets, with lead organisation the Young Foundation and in partnership with Uscreates and Real. The Young Foundation tackles social challenges by working alongside communities; Uscreates uses a design-led approach to drive social transformation; and Real ensures that disabled people and those with long-term health conditions in Tower Hamlets are actively involved and engaged in the community. The programme runs for three years and will involve multiple neighbourhoods, their residents and local organisations. Evaluation of the programme is supported by experts from the University of East London (UEL). Download C3’s report detailing the Collingwood Estate community members’ investigation findings and recommendations.